Happy Thursday to all of you, and technically, this is Friday because the 4th of July holiday starts tomorrow! Hope you all have some great things planned for the extra long weekend! 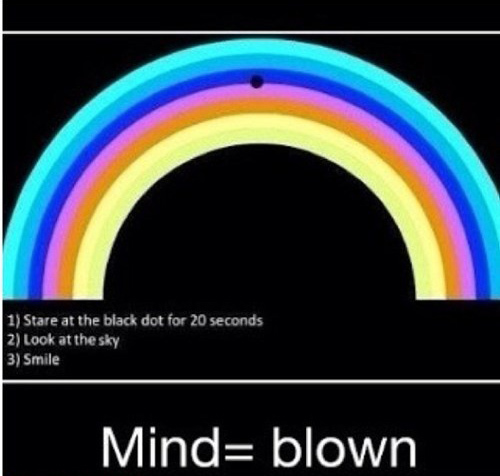 Now, today’s optical illusion is all about rainbows, and in order to see one, all you have to do is follow the directions. After all, who doesn’t love to see a rainbow in the sky no matter what the weather truly is? Not convinced that this optical illusion actually works? Well, there is only one way to find out isn’t there? Go ahead and try it, and it does work, please don’t be shy because we love to hear from all of you so be sure to leave us a comment about the optical illusion. Optical illusions are a lot of fun, and here is another great one that is all about psychological testing. Have any of you ever taken any kind of ink blot test to see what you can see? Well if the answer is no, now is your chance! Take a look at these psychological cards, and what do you see? Some of them are quite complex, and you can actually see many different things in the cards, but be sure you leave a comment below and tell us what you see!